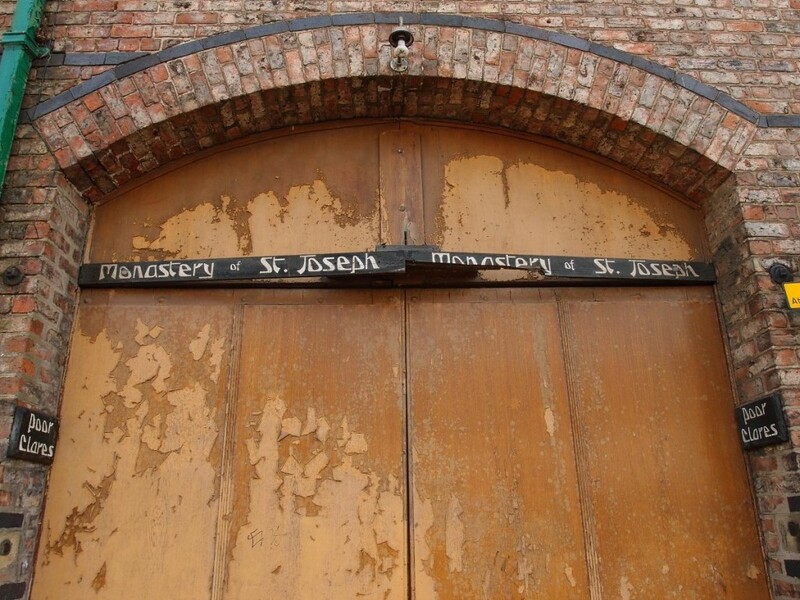 Last year, around this time, a long walk across town took me past the doorway of the ‘Poor Clares’ on Lawrence Street. I stopped to take a few photos of these hand-painted signs, before they were gone. Back in 2004, on one of my ‘York Walks’, I’d wandered past this convent and become aware of it for the first time, and caught a glimpse of its buildings behind the high walls. It’s not on my side of town, so I haven’t passed it often since, but I was aware that the nuns had left and that a planning application for its conversion to student accommodation had been approved. Serenity was my impression when I passed by in 2004. Sadness when I passed by in April 2015. Those signs seemed to encapsulate the community on this site, endearing hand-painted lettering with its own particular style, of a different time. “But it’s only bricks and mortar,” the Mother Abbess said, in a nice feature in the York Press. But it isn’t just that, is it. When people live in a place for long enough and make a garden there and plant trees and grapevines and make quiet space for visiting wildlife, it’s much more than that. I’ve heard that the grapes from the grapevine used to hang over the boundary wall near the bus stop on Lawrence Street. I’ve heard that the redevelopment keeps the orchard — perhaps where the grapevine is. I wonder what will survive the building site. If I lived on this side of town and had to pass it every day I’d be finding this redevelopment very difficult. On the other hand, it was inevitable. There’s a nice article in the Press: Convent Life on the Quiet, by Stephen Lewis, from Feb 2015. Only eight nuns occupied the site, in the end. Hence the sale of the site. There’s a more recent page on the developments at the Poor Clares (30 May 2017). As a young boy I used to pass this place every morning on the way to St. Lawrence’s school. It was sometime around 1970 and there were always a small band of homeless men queuing up for their free breakfast: I believe that they also got a change of clothes. I remember being fascinated by the high wall which, to a small, boy, aroused my curiosity as to what was behind it. Living just over the road in Arthur Street, there were a number of places that were just crying out to be explored, such as ; the scrap yard, with what sounded like a viscous Alsatian behind its’ door on the corner of Bull Lane; or the council tip and surrounding overgrown land that stretched all the way back to Derwent Valley Light Railway. For 2 years I tried various rouses to get beyond the convent wall; from piling up some old crates: my excuse to passers by was that the wood was for my bonfire; to taking a more direct approach and walking in through the gate, only to be chased off by a not so friendly nun. I never did manage to find out what was behind the wall and it wasn’t until the onset of the internet that I finally found out what I’d missed out on. As a student in York in the late 70s, I remember calling there to buy eggs. There was some sort of small door or hatch, where a shy nun would emerge for the shortest possible time, complete the transaction and disappear inside again. Mike and Andy, thanks for adding these memories, so evocative. I wasn’t aware of the place at all until 2004, and have only passed by occasionally since. Nice to read more about it, thank you. My mother talked about the Poor Clares in York. She was born in Kitchener Street and was one of the Shortle family . Her mother was a great admirer of the Order though not a Catholic herself. It was well known that beggars who knocked at its door were never turned away hungry. What a sad end to their old home , yet again going to be filled to the gunnels with the less that attractive housing that is destroying York and cities countrywide simply to make a quick buck under the banner of ” growth “. Twice there have been ‘Open’ events at the Poor Clares to celebrate notable anniversaries of being there such as 150 years there. All the convent was open and there were afternoon teas. In the 1970s there was a Christmas carol service in conjunction with St Lawrence’s church and it was always a sell-out. Although it was not feasible for the few remaining sisters to maintain and heat such large buildings and gardens it is sad to see what a mess it all looks at present. The sisters will have access to the burial area when the site is completed. Lawrence St has been ruined by the out of proportion student blocks. One hopes the cobbles will be replaced along Lawrence St outside the convent.